EMT Bryan Jones with the Sweeny & West Brazos Emergency Medical Services, gave a presentation of the American Heart Association Heartsaver® CPR & AED training course, sponsored by Friends of the River San Bernard. Ten river residents participated in the hands-on training session on Tuesday, July 17. Cardiopulmonary resuscitation (CPR) is a lifesaving technique useful in many emergencies, including heart attack or near drowning, in which someone's breathing or heartbeat has stopped. Use of an AED or automated external defibrillator, used in cases of life threatening cardiac arrhythmias which lead to cardiac arrest, was reviewed in the class. 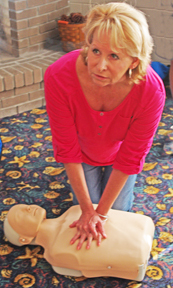 Ange Ronayne practices CPR chest compressions, the first step in the lifesaving technique. Class participants hold training mannequins used in teaching emergency medical conditions. Bryan Jones, instructor, stands in the middle of the group. Great technique Ange! I have taken many CPR classes and this one was one of the best. Thank you for volunteering your time Bryan (after performing your EMS duties the entire 24 hours before). We appreciate our EMS Services.